Former Chief Justice K. Sripavan has been appointed to the Board of Commercial Bank as an Independent Non-Executive Director from yesterday. He was the Chief Justice from January 2015-March 2017. During this period he functioned as the Chairman of the Judicial Services Commission, Incorporated Council of Legal Education, Sri Lanka Judges Institute and Superior Court Complex Board of Management. 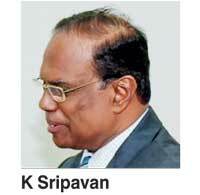 Sripavan enrolled as an Attorney-at-Law of the Supreme Court in 1977. He obtained a Diploma in Industrial Law from the University of Colombo in 1992 and a Master of Laws from the University of London in 1994. He functioned as the Head of the Court of Appeal Unit of the Attorney General’s Department and handled a large volume of work both in the Court of Appeal and in the Supreme Court including Bills and Fundamental Rights applications. Prior to his elevation to the Court of Appeal Bench, he functioned as a Legal Consultant for the National Savings Bank for two years. He was appointed a Judge of the Court of Appeal in May 2002 and was elevated to the post of President of the Court of Appeal in March 2007 by the President. In March 2008 he was elevated to the Supreme Court Bench. With the latest appointment, the Board of Directors of Commercial Bank Plc comprises K.G.D.D. Dheerasinghe (Chairman), M.P. Jayawardena (Deputy Chairman), J. Durairatnam (Managing Director/CEO), S. Swarnajothi, S. Renganathan, A.K.W. Jayawardane, K. Dharmasiri, L.D. Niyangoda, N.T.M.S. Cooray, G.S. Jadeja, T.L.B. Hurulle and K. Sripavan.